It is a conversation with Nottingham living historian Robin Hood, Tony Rotherham that began this journey and the film. Could the Arboretum really be the inspiration of Neverland? JM Barrie once lived very nearby in his tenured youth working for the Nottingham Journal albeit for only a brief 2 years. Barrie apparently walked each day to the city offices through the arboretum, full of beautiful trees and open spaces that today now more than 100 hundred years on is still very much enjoyed by residents of the city and visitors. Nottingham struggles to promote its historical tourism, outside of Edwinstowe and a shop on Frair Lane close to the castle. There’s nothing tourism wise on the legend of Robin Hood. The knowledge of another famous figure, fictitious sure. One that is deeply embedded in popular culture could potentially generate tourism for the city of Nottingham. The structure of the video has to have clear aims and explore the questions. Approachable, likeable and informative, with the viewer inspired to go and learn more! This shaped how the framing was created, what is J.M. Barries actual connections to the city? Why did he come here? What did he do whilst here? Recording footage and photographs of the plaques in the heart of the city. Unfortunately, a whole section of the pedestrianized street had been overturned for roadworks. The plaques at his former address – When eventually found his address, up a small stairway leading to the road off Peel Street. The address on the left, not a few doors away. Was intending to knock on, ask some questions of the residents what they knew, how does it feel to live in the same space as someone so influential in English literature. The intention of splicing in some interview footage. However though very much against it, as I approached. As my Facebook post status of the time highlights. Burly southern Sudanese-looking mother (of course, could be wrong) she was pissed! Not at me, I assure you. I was only passing the short gate. Not sure what her kids did, but damn. Don’t have to speak the language to know the equivalent of lots of f*cks given. One of the young kids went to the bay window off the back of the sofa, a moment of pause to gauge then got pulled back in one swift swoop like in a horror movie. Was like o…k… then, won’t be knocking on, just kept walking and snapped a couple of pics of the plaque. When asking people in casual conversation with friends and colleagues, about Peter Pan. His appearance and similarity to Robin Hood came up more frequent that I expected, so the question then arrives of, with the connection of Peter Pan in Nottingham, is the costume, appearance-related or inspired perhaps? Which we explore conclusively in the video. Barrie chanced upon a child, dressed in rags playing around the trees. “See that lad”, Barrie said. “His name is Peter and he has lost his shadow. His sister pinned that rag on him for a shadow. So took up the task also of becoming familiar with the source material, acquiring Peter Pan and Wendy. It’s quite amazing to see how different childrens’ book these days compared to 110 years ago. Very much enjoyed. Watched the various on-screen adaptations and also the stage pantomime at the Nottingham Theatre Royal of Peter Pan… was more the Joe Pasqualeuele show really. Admired why the producers took certain liberties and inspirations. 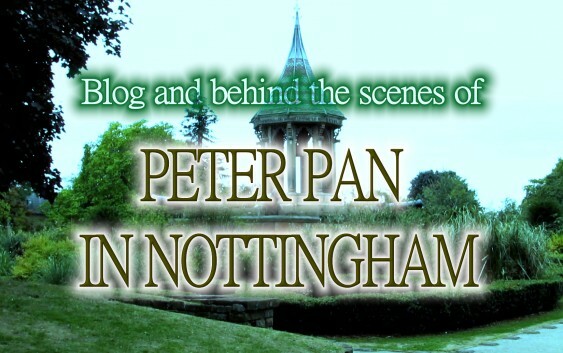 The video “Peter Pan in Nottingham” becomes themed into stages through the editing process. What happened at Clifton Grove? Was absolutely beautiful mid-Autumn, yellows, oranges and rich reds as can be seen colours unaltered in the final video. There were scenes shot featuring myself talking and exploring the Grove. Then on the 3rd or so take, got utterly soaked through as the heavens opened! They weren’t used in the end because the audio quality sound was too different to the studio recorded version, and it covered the same points. Also got to film additional scenes for the Fortean video of Clifton Grove and the famed forboding ill omen mermaid/dolphin/sturgeon, in the river Trent near the Clifton Hall. Got to head out with the partner in crime and shoot some B-Roll footage of the Arboretum for a fun afternoon and utilize footage I shot from 2018s and 2017s Pagan Pride festivals. This Peter Pan in Nottingham culminates into a round-up of facts and information conclusion, then encouragement to go walk the inspired routes of JM Barrie. Let your imagination run wild! Its a fun approachable short documentary considering its only about 6 minutes, have put many, many hours into its creation. Thank you for reading. Kristian. Peter Pan and Wendy 1908. All used in relevance to the context of the subject matter under fair use. Though despite taking a few months to put together, hours upon hours of reading, researching, filming, producing, editing its highly likely Disney, Warner Bros will swoop and make monetization.